A hush falls over the crowd, and for a moment, the gym feels more like a library. Two teams of students sit attentively, awaiting the next question. As soon as the MC finishes the question, the students excitedly whisper within their teams, discussing their response. One team has the chance to answer -- and the other team waits, ready to respond if their competitors can’t. After a brief celebration for the right answer, the hush falls again, and it’s on to the next question. The suspense was all part of Battle of the Books, a fun event celebrating "March is Reading Month." 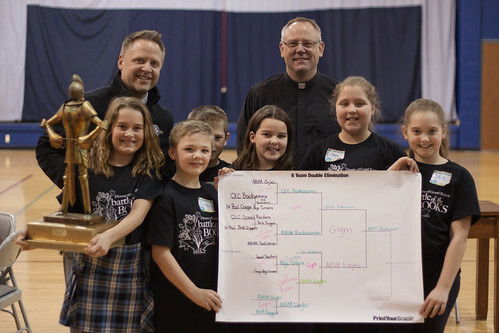 The competition brought fourth graders from several Catholic schools to Assumption of the Blessed Virgin Mary in Belmont on March 20. Teams from Assumption, Our Lady of Consolation in Rockford, and St. Paul the Apostle in Grand Rapids participated. Teams prepared by reading a selection of books, including several faith-based titles. Then, teams competed in a double-elimination tournament to see who remembered the most of what they read. Ultimately, a team from Assumption of the Blessed Virgin Mary won the trophy. It was a great day of friendly competition, and it’s sure to be exciting when fourth graders gather for next year’s event! See photos from the event in the gallery below or at this link.